Here is the ultimate light weight engine. 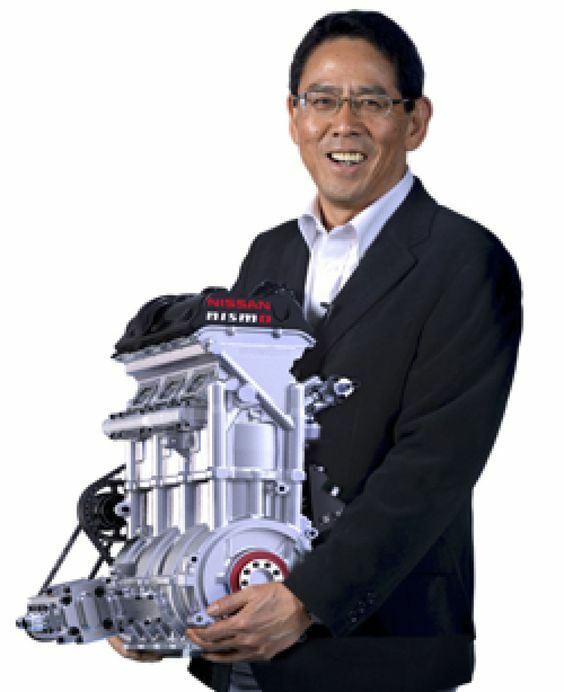 This Nissan 1.5L 3 cylinder engine is being held by Nismo president, Shoichi Miyatani. He's smiling because the engine packs 400HP and 280lbft of torque, yet it only weighs 40kg (88lb) . The base engine is only 500mm tall x 400mm long x 200mm wide (19.68" x 15.74" x 7.78"), so it fits in carry-on luggage. It was used in the 2014 24 Hours of Le Mans racecar. At 400 HP, I assume there is an associated supercharger or turbo associated with it too? It certainly would be an interesting engine for a Locost if it was available and affordable. As long as we're talking SR20DET's I just pulled mine yesterday and used the chance to weight it. I think this basically agrees with the data just posted. Here it is basically entirely ready to run. Flywheel (chromoly 12ish lb), clutch, turbo, intake, throttle body all still on there, really just yanked it out of the car and weighed it. 361 lb. If you want to get picky there's about 10lbs of intercooler and plumbing still in the car that wouldn't be there with a non turbo engine. When I took the clutch and flywheel off it was 332. 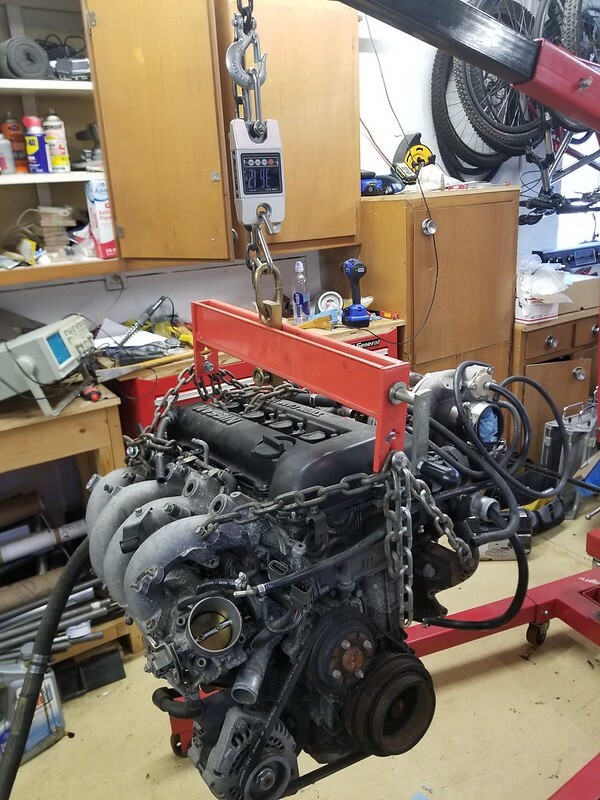 As it goes back together I'll get a weight without the turbo and manifold for and engine to engine comparison to my NA BMW engine going in the Stalker. This power plant is designed to run high performance hybrids. In other words work part time. My guess is that this will never make the market (but I could eat my hat on this). Nissan just like the sister company Renault is trying to position itself as the World high tech manufacturer of the future. By the way the Renault Nissan Mistubishi group is currently the first World car manufacturer. This little mill was probably built with a light alloy crank and most of the other parts. If it ever makes the market it will be heavier and not rated 400 bhp. But again who am I to think that way!!!!! Well you could always go with one of the Ford 3 cylinders. They aren't a slouch either. From that picture it doesn't look like the crankcase splits. I wonder what they're doing there? This power plant is designed to run high performance hybrids. In other words work part time. The part time is true, but when it runs it will run at a high power level. Your average car is running way below it's power capability most of the time and that makes it inefficient for mileage. Making the engine smaller and working it harder makes sense from a performance/pollution/mileage point of view and then you use electrics to make the car accelerate fast and make it's humans feel powerful. It doesn't make sense from complexity/cost etc. point of view though. I noticed that too. Sometimes you see engines where the head is part of the block. I think not needing a head gasket and head bolts is a pretty big win. In both cases it helps with strength and assembly and especially so with automated machine tools and assembly. Standard SB2 with drysump pump and lines, carb and lines, distributor, alternator, water pump and lines, power steering pump bracket and pulley (no pump). 9K rpm with pushrods sounds awesome, but not street friendly. Thanks for making the effort to give an honest weight. No flywheel and clutch in that weight, though they are pretty light for that motor I'm thinking. Iron heads, strong block and filled with stout pieces for 9k RPM, not a wimp! Triple disc 5.5” clutch is right around 14 lbs complete. It’s a decent package but not street friendly at all due to rebuild costs and short 1500 mile timeframe. I weighed my 5.0/T5 combo when it was pulled last. The good news? You're going to have so much power and torque with those small block Fords, that in the end you'll be laughing at yourselves for obsessing over a few pounds now. The bad news? Your working weight is a little optimistic. If you account for every necessary part and fluid, I think you'll need to add in another 40-50 pounds. My Ford 3.8L V6 with virtually the same setup is about 570 pounds ready for the road (see viewtopic.php?f=4&t=4299&start=105 at the bottom of the page). Threw the intake and accessories [PS pump, alt, starter] and stock heavy flywheel onto it. There's a tensioner bracket missing and I dont have the exhaust so I cant add that to it. I'd guess its older sibling is super close in weight as well. Theres 2 balance shafts in there but I dont know how much they weigh and what it would feel like without them. This version is rated at 240hp and 240 torques, runs off the gm E67 ecu.